I always look forward to receiving flowers on special occasions for obvious reasons. 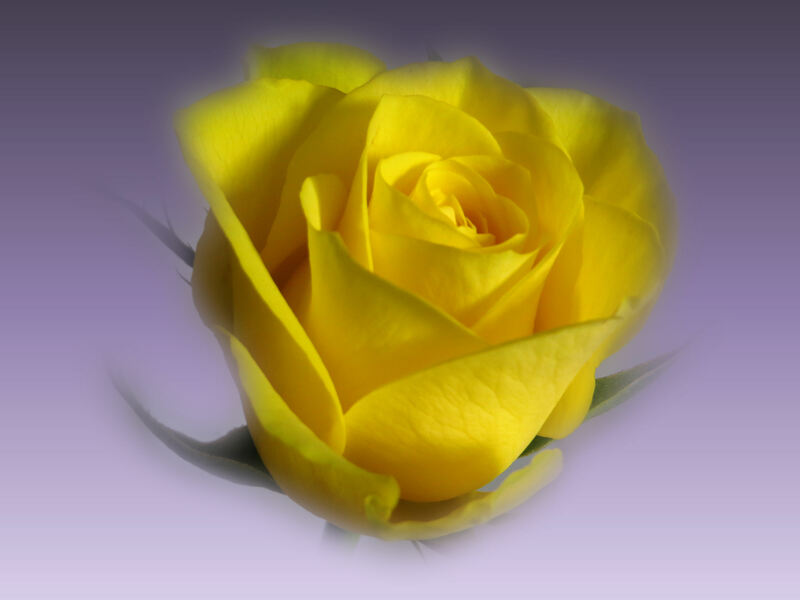 Roses, of course, are a classic subject for photographing against a black background, so here are my offerings …. 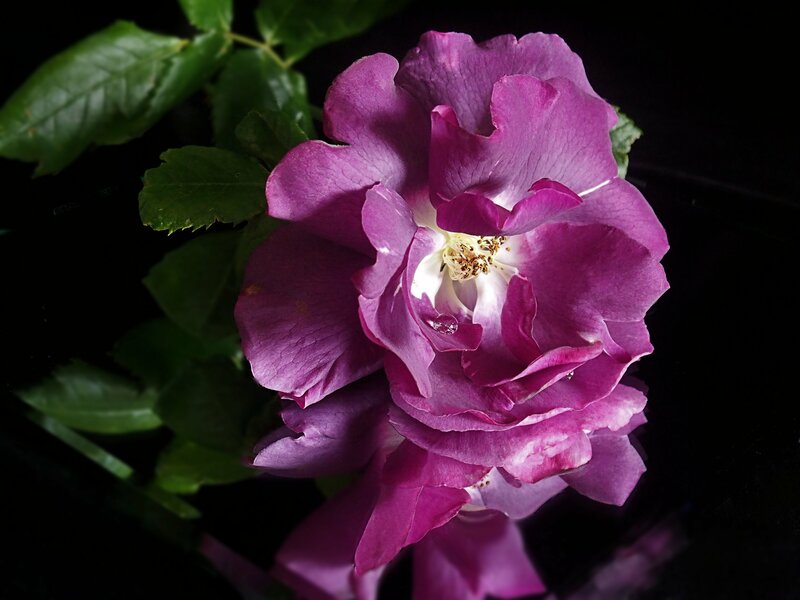 This rose is called ‘Rhapsody in Blue’, although in truth it is more a magenta/purple colour. The buds start off a deep magenta and then change to purple, lilac, and an almost grey/lilac as it fades. It was much too windy to photograph outdoors so I set it up indoors and spent a couple of happy hours taking photos and then trying out various crops and effects. I decided I would put a droplet of ‘rain’ on the petals but after it wouldn’t stay where I wanted it to, I just let it fall where it may. I quite liked this ‘effect’ which is called ‘Deep Forest’ it gives it a depth of colour with a more hazy look. The poppies, I think, will easily divide, so I’ll be able to give some to friends. For the most part the chosen plants have all behaved themselves, but I bought an achillea that has spread far too rapidly – the flowers are a deep pink and appear to be more invasive that the lovely pale yellow variety I had in my old garden. So – I will get them dug out and passed on to my daughter who likes the feathery leaves. I’m not able to do the digging and planting [because of arthritis/hiatus hernia etc] so I have to rely on a gardener to do it for me. Unfortunately he is very busy and tends to fit me in when he can …. I also rely on my son to take me out to Garden centres etc. when I need more plants. At the moment it seems to be all reds and pinks showing , so I’m on the lookout for some pale yellows/blues. Irises [which I love] would probably fit the bill but the one I bought last year must have made a nice meal for the slugs as it hasn’t re-appeared. Either that or it didn’t like the sun [no shade here whatsoever] or the soil isn’t right. P’raps someone could enlighten me? My all-time favourite rose is now blooming – it is called Cream Abundance, so I just had to take pics of it again…. This is the shrub rose that my friends gave me recently. The label on it tells me it was ‘Rose of the Year 2003’ and I can certainly see why. Colour may sometimes be called what it isn’t, eg in the Cat breeders’ world, a grey-coated cat is referred to as ‘Blue’ – as in Blue Persian, or a ginger cat is Red, as in Red-self. And so it is in the plant breeders’ world it seems – for it says clearly on my Rose’s label that it is a purple rose , changing to slate grey as it fades. But Blue? – no – that is the colour of the sky. 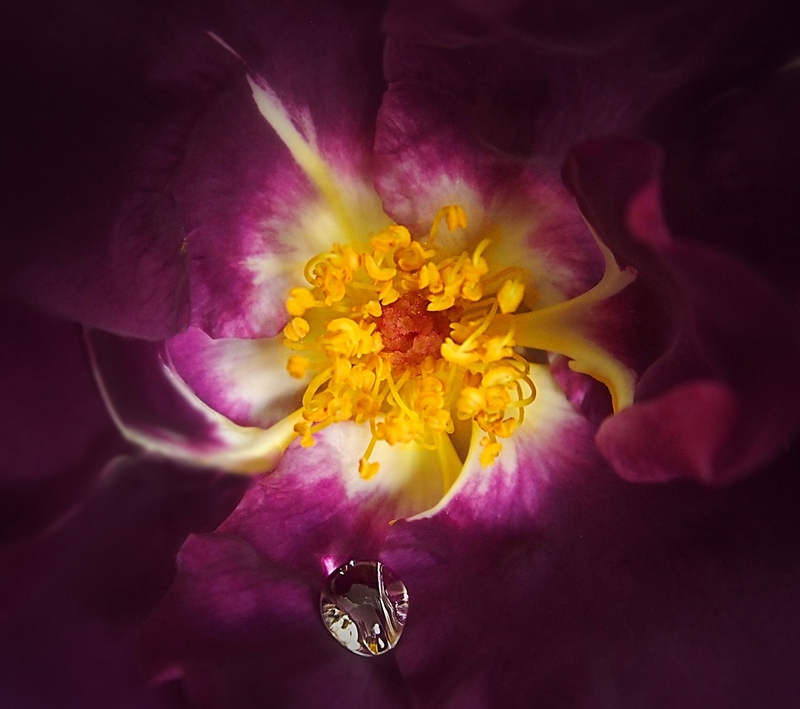 Still, leaving aside the anomaly, it is a truly beautiful rose and I love its name. It photographs well too. I love to get ‘creative’ and I have a couple of mirror tiles that I like to use sometimes. When I can’t find fresh inspiration I sometimes go back and have look through my photo library to see what I could have a bit of fun with. I love using my Paintshop Pro to get creative and try out different effects. 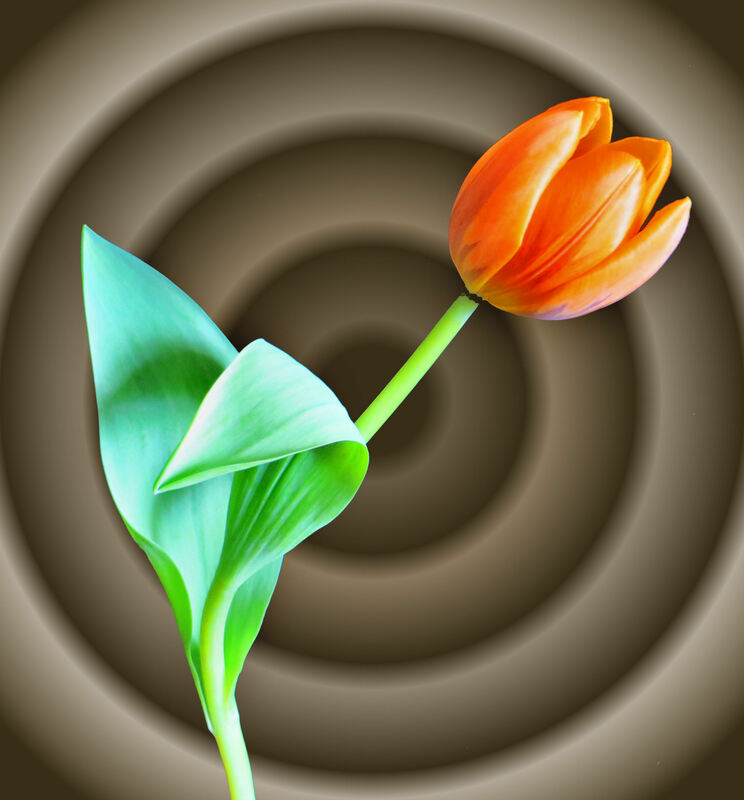 Tulips have a lovely sculptural quality to them and I experimented with ‘Gradients’ using the Flood Fill tool on the image background. I’m quite pleased with the results. 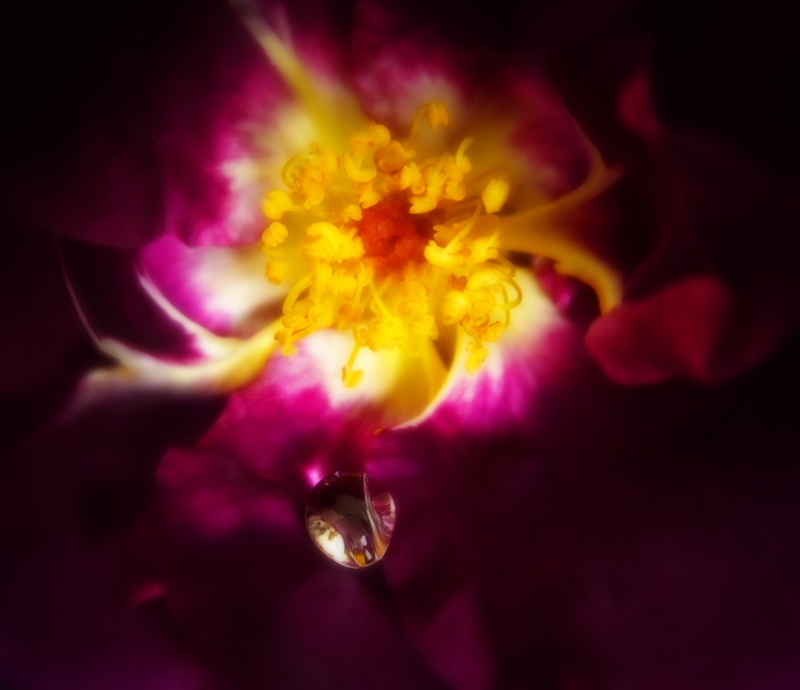 I thought the Rose needed something a bit softer …..